Photo-Refractive Keratectomy (PRK) became popular worldwide in the early 1990's and in the USA in 1995 when the Excimer Laser was first approved by the FDA for laser vision correction. The Excimer laser brought tremendous advancements to refractive surgery. PRK is performed in the comfort and convenience of an outpatient, Excimer laser suite. First, very powerful eye drops completely numb the eye. Next, the clear, protective surface layer (epithelium) of the cornea is loosened from the underlying layers of the cornea and is either removed completely or moved to the side. Then in a matter of seconds, the Excimer laser is applied to the cornea, reshaping it to the correct focusing power. After the procedure, a protective contact lens bandage is placed on the eye to make it more comfortable during the healing process. It usually takes three to five days for the epithelium to fully heal. Most PRK patients notice an improvement in their vision soon after surgery. However, vision is usually somewhat blurred during the epithelial healing process. Some PRK patients may prefer to have one eye treated at a time with the second eye being treated within a week or two. 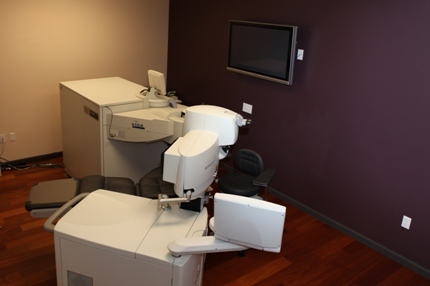 The LASIK Surgery Suite at Northern California Laser Center. All our LASIK and PRK surgeries are performed right here in the Modest Eye Center office on Coffee Road in Modesto. The physicians of Modesto Eye Center and the Northern California Laser Center are renowned Modesto and Stockton lasik eye surgeons. They are also considered Modesto and Stockton cataract surgery specialists. These physicians treat LASIK Modesto and cataracts patients from their Modesto offices.